All of the newspaper clips I read on this episode were found online using Newspaperarchives.com. I only use the beginning of the sound of the typing on the keys. The full sound has all the bells plus you can hear the paper going into the paper roller, which is quite fun to remember, speaking as someone who actually remembers using a manual typewriter (my mother had one when I was a kid). Note that the standard podcast theme song; the music that introduces the May 1905 newspaper clipping about Glen Porter; and the standard camera shutter sound are all from Garage Band. In today’s episode I want to bring you something a bit different. Normally I would piece together a narrative from the research my husband, Chris, and I have done in newspapers, census records, etc. But for today’s story, I invite you to join me on a journey of discovery as we read through some of the newspaper clippings and other records between 1899-1905 and meet Glen F. and Beatrice Porter, photographers from Ritzville, Washington. Mr. Porter is a popular photographer of the city and has many friends here. The News also takes pleasure in extending the glad hand of fellowship and wishes Mr and Mrs Porter a happy voyage over the matrimonial sea. G. F. Porter, the photographer, accompanied by his wife, has returned after several months absence. G. F. Porter, the photographer, continues business at the old stand. Porter, the photographer, continues to do work at popular prices. Mr and Mrs G. F. Porter left Sunday morning for Dayton on a business and pleasure trip. They will be away for two weeks. The photograph gallery will be closed during their absence. G. F. Porter, the photographer, is taking his summer vacation at Dayton and will be absent for six weeks, Mrs Porter conducting the gallery during his absence. G.F. Porter, the photograph artist, returned Friday from Dayton, Washington, where he had been sojourning with friends for sometime and enjoying a well earned vacation. Mr and Mrs G.F. Porter, the popular photographers, have moved into the house recently vacated by Clyde R. Hervey, which is only a few doors west of the gallery. Mr and Mrs G. F. Porter, the photographers, contemplate removing to Colorado about April. The gentleman enjoys better health in a high altitude, hence the desire for the change. The worthy young couple have many warm friends here who will regret their departure. They have enjoyed a lucrative business both being fine artists, and they will be missed in church work and in many other ways where they have been permanently welcome. Glenn F. Porter, the photographer, is building a new main part to his gallery for the accommodation of the artist who is coming to take his place about April 1st. Mr Porter will retire and rent the gallery property. They will leave soon for Colorado where they will go to reside permanently. Mr and Mrs Ankerson, the new artists of Spokane, have arrived and will take charge of the gallery next Tuesday, March 25th. J. L. Dietrich has this week sold his music and machines store to G. F. Porter & Co. Mr Porter is a new arrival from Ritzville in the state of Washington and is a friend of F. E. Baker who put the deal through. We have a large assortment of second hand sewing machines in good order that will be sold at reasonable prices. — G. F. Porter & Co., 821Main Street, successors to Miller and Dietrich. Great discounts on organs of many makes at G. F. Porter & Co, successors to Miller and Dietrich. The sale will continue ’til January 1st. An appropriate Christmas gift would be an Edison or Victor talking machine. G. F. Porter & Co. have them. The friends of Mr and Mrs Glen F. Porter, who formerly conducted a photograph gallery here, will be pleased to learn that the gentleman has recovered his health and is enjoying life in Greeley Colorado and following their usual vocation. “We’ve been thinking for a long time we would write to you, but we always have so many other things to do it seemed we could not find the time. Hope this will find you all well as it leaves us. Suppose you have heard we were located in Greeley, Colorado, and have the largest music store north of Denver. We like this place quite well, or as well as we can be expected to like any place outside of Washington. In all our travels, over 1400 miles of country including parts of four states, we have seen nothing that suits us as well as Ritzville, Washington. “However, this is a very productive country and as for beauty it cannot be surpassed. Its principal products are sugar beets and potatoes, although there are large amounts of other vegetables such as cabbage, onions, etc. “Find enclosed $1.50 for which please send us your paper, as we are lost without the News. Signed Mr and Mrs GF Porter, Greeley, Colorado. Glen F. Porter of Greeley, Colorado, was in the city the first of the week, invigorating old friends with his handshake. The gentleman is looking fine and is in excellent spirits and has much benefited in health since leaving Ritzville. He reports his wife in poor health and send her respects to all old friends. Having recovered, he expects to leave Colorado and we may again soon have this worthy young couple located with us. Glenn F. Porter has returned from Greeley, Colorado to re open his photograph gallery, the second door west of the First National Bank. Mr. and Mrs. R. T. Ankerson, the artists who have had the property leased for some years, will probably locate at Lind. Mr. Porter recovered and is now enjoying very fair health. G. F. Porter, the photographer, closed his gallery yesterday on account of ill health and left last night for Dayton where his relatives reside. His brother J.F. Porter came over to assist in removing him where he could have the best of care. The gentleman spent last year in Colorado and the condition of his lungs was much improved, but the past few days has brought a decided change for the worse. Mrs. L. M. Starr, Mrs. Barronnett, and Mrs. W.P. Taylor went to Spokane Monday for a short visit with Mrs G. F. Porter, who leaves soon for Colorado for the benefit of her health. Mr and Mrs Riley Parlet left Thursday for Spokane to bring their daughter, Mrs G. F. Porter, home. Mrs Porter had been there for quite a while taking medical treatment and is much worse. G. F. Porter, proprietor of the leading photograph gallery, leaves the latter end of the week for Dayton on a short visit to his parents, going then to Colorado for treatment of consumption. He has had several serious hemorrhages in the past week which necessitates his hurried departure, in the hopes of being benefited by the change in climate. A communication from Dayton, Washington brings the sad intelligence of the death of Glen F. Porter in that city, Friday, May 5, 1905. The deceased was 31 years, 4 months and 7 days of age at the time of his demise. For the past three years he had been declining with consumption and for a while took a change of climate to Colorado, returning here a few months ago apparently improved in health so much so that he again opened his photograph gallery and did work again until prostrated. Mr Porter was an upright Christian gentleman, a member of the M. E. church, and his untimely end is deeply regretted by all who were fortunate enough to know him. The largely attended funeral occurred Sunday afternoon at Dayton. 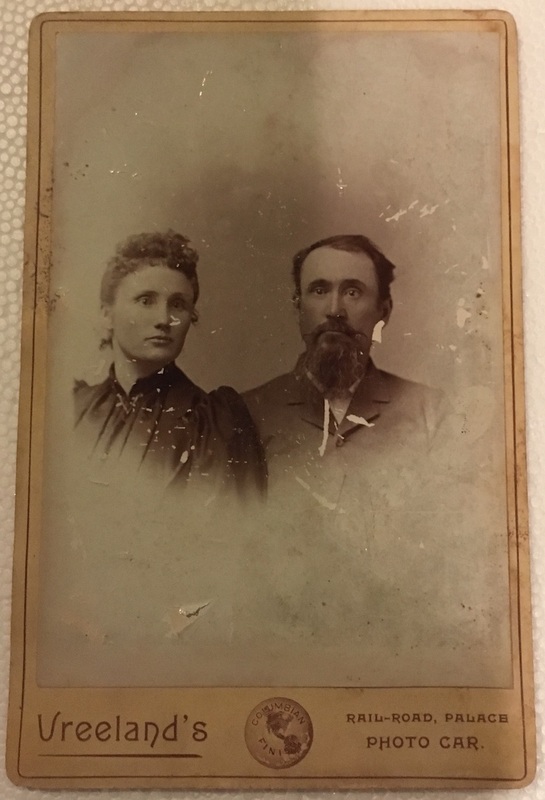 Now, while there’s no newspaper clipping that actually talks about what happened to Beatrice Porter, by looking for Glenn Porter and his grave in Dayton, Washington, we discovered that Glenn died on May 5, 1905, and he’s buried next to his wife, Beatrice Porter, who actually died two weeks before on April 19, 1905. Glenn died apparently at the home of his relatives there in Dayton; Beatrice Porter’s death certificate says that she died at the home of her parents in Pomeroy, Washington. So, there you have it: from 1899-1905, six years in the life of Beatrice and Glenn F. Porter. Wow, I mean, we’ve got marriage, music, and mortality; life and death of an early photographic couple, when life was not exactly easy, was it. I mean, here in the 21st century, I’m just reminded that we are so far removed from the realities of living with the threat of tuberculosis, it’s just easy to forget how horrible [this disease] really was. Years ago I worked in a building on the Oakdale Campus near Iowa City, Iowa. That campus had actually originally been a sanatorium for TB patients in Iowa in the early 20th century. I remember reading about it at that time, that the the doctors really didn’t have any idea how to make people with tuberculosis better. One of the things that was thought to help was fresh air. So, this sanatorium was built with a lot of open air porches, and the patients would be sort of bundled up in clothing and then sat out on beds in the open air, including in the winter when it could easily be twenty below freezing (temperatures). Or in the summer, they be out there roasting in temperatures that were well above 90 degrees for most of the summer. So, for a young couple like the Porters, I mean, the odds of getting better were minimal at best. Glen F. Porter was only 31 when he died; Beatrice was only 26. I have to say, as we uncovered these clips and progressed through this research, we really hoped that at least one of them would beat the odds. Or, at least their venture with music and machines in Greely would really take off and be successful for number of years … or something … but of course, that was not to be. There are moments though along the way in their story that are a little bit fun, though. I mean, when they are selling the *machines* that includes apparently —according to the newspaper ads — both sewing machines and talking machines. I guess around 1900 machines were machines, whether it was something for sewing or something new-fangled like a talking machine. It was also interesting to read that Glen takes a summer vacation and leaves his wife busy working in the studio that one summer . But, knowing what comes later, I started to wonder, well, maybe he was actually starting to get sick that summer, and he went to Dayton where his relatives were, to try to recover. And maybe they put those notices in the paper to just make light of it so that the people there in Ritzville, Washington wouldn’t realize how sick he really was. So it’s fascinating, though, how much of the outline of what is ultimately a rather tragic story is laid out there in the notices in the newspapers. From their initial start as a hopeful married couple there in Ritzville in 1899, when he’s just opened his photograph gallery … and then, you know, they moved to a new house … but then, of course, he gets too sick and have to go to Greeley Colorado ….but then they are able to get a business going there. But then the notices do sort of mark their ultimately futile attempts to beat TB, the thing that ultimately kills them both. While the Porters weren’t photographers for all that long, I really think their story is worthy of mention here because it really is the kind of thing that is so fascinating about doing the research on these early women photographers, really getting a sense of life and what things were like beyond photography in the late 19th and early 20th centuries. I mean, the Porters were not in business in Ritzville, Washington for all that long. But my husband, Chris, did find on eBay a photo done by the Porter studio in Ritzville, Washington! So, we got it, and I’ll put a copy of that in the episode notes. There’s no way to definitively date that particular picture, but of course we know that the Porters were in business only between the time of 1899-1905. I have an archivist friend who talks about how she’s “saving lives” when she uncovers information about an obscure photographer and brings the story to life to a new audience. So thanks for joining me today as we “save” the lives of Glen and Beatrice Porter. We couldn’t save them from tuberculosis, but at least we save their memory by celebrating their story today. 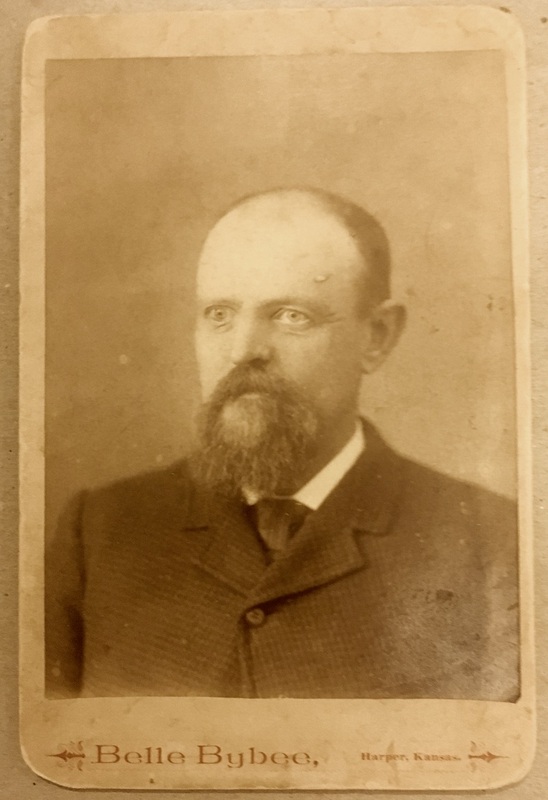 The photograph that Chris found on eBay from the Porter studio in Ritzville, Washington, and the credits for all the sound effects and music I used in today’s episode, will be in the episode notes for today’s episode at p3photographers “dot” net. That’s letter “p”, number “3”, photographers “dot” net. And remember, you can drop me an email at podcast “at” p3photographers.net, or follow Photographs, Pistols & Parasols on Facebook at facebook.com/p3photographers. You may have taken note that when the Porters go to Colorado for their health, their studio in Ritzville, Washington is taken over by Mr and Mrs Ankerson. The Ankersons, Richard and Josephine, have a long marriage I’m happy to say, and a very long career in photography. Their two daughters also become photographers. Chris and I are still looking into all their details and that’s definitely a story for another day, but probably not next time because we still have to work it all out. Until next time, I’m Lee McIntyre and this Photographs, Pistols & Parasols.